With just a little over a week until the release of the widely anticipated franchise revival Jurassic World, the early buzz is more than promising. Yet, for Tonight Show host, Jimmy Fallon, the buzz is more immediate, due to the self-confessed Jurassic Park fan having a cameo in the new film, and the fact that it looks like there may be more to his role than a simple walk-on spot. Appearing last night on The Tonight Show with Jimmy Fallon, Bryce Dallas Howard wound up spending just as much time discussing Fallon’s Jurassic World cameo as much as her own co-starring role in the film. During the exchange, Fallon - at first vaguely described his cameo by referring to the fact that folks behind the film "asked me to do this tiny little thing," – celebrated the scene apparently made the cut. Yet, cutting through the clearly sarcastic fun the two were having over the apparent breadth and importance (or lack thereof) for Fallon’s cameo, there seemed to be signs possibly pointing to its further significance. 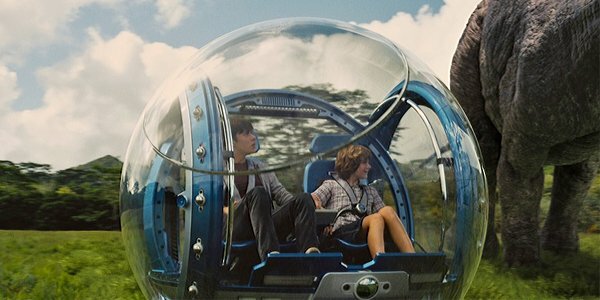 News of Fallon’s cameo actually had been known about for the better part of a year due to leaked photos of a sponsor-laden Jurassic World brochure, which contained a section about the transparent spherical vehicles showcased in the trailers called the Gyrosphere. (Pictured below.) The passage mentions that prior to take-off, the patron passenger transports feature an on-site instructional video starring "comedian/video host Jimmy Fallon." It all sounds like a rather innocuous quickie, showcasing the default King of Late Night television. However, coupling the context of those details with the further conversation between Howard and Fallon, you get the sense that Fallon’s instructional video star might be the center of a humorously memorable scene or two. As the conversation describes the film’s premise with the titular theme park’s ill-advised attempt to boost attendance by creating a dangerous new hybrid species of dinosaur, known as Indominus Rex, Fallon then jokes about saving the day and fighting a dinosaur at the end. However, at this point, Howard, seems to want Fallon to put a cork in it; perhaps indicating that the sarcasm was flying dangerously close to a possible truth. Interestingly enough, Fallon also pointed out another interesting bit of trivia in the fact that Bryce Dallas Howard’s daughter also had an apparently memorable walk-on of her own in the film, depicted hugging a dinosaur during a scene at Jurassic World’s petting zoo. Yet, when it comes to Fallon’s scene, he seemed to be genuinely ecstatic that the bit of work he did for the film made the cut, pretty much confirming it as minor. However, judging from the overall tone of the conversation, it could be the case that his work was utilized in a manner that surprised him. Sure, we could be reading too much into things and it all might just be the product of a humorous rapport. However, for Fallon, whose post SNL aspirations as a film star did not quite go so swimmingly as they did for him the late night arena, a memorable side-splitting cinematic scene might just be a form of redemption. Jurassic World unleashes a new kind of chaos theory at theaters on June 12th.